Well I haven't been stitching too much in the last week. I still managed to finish a few small pieces. 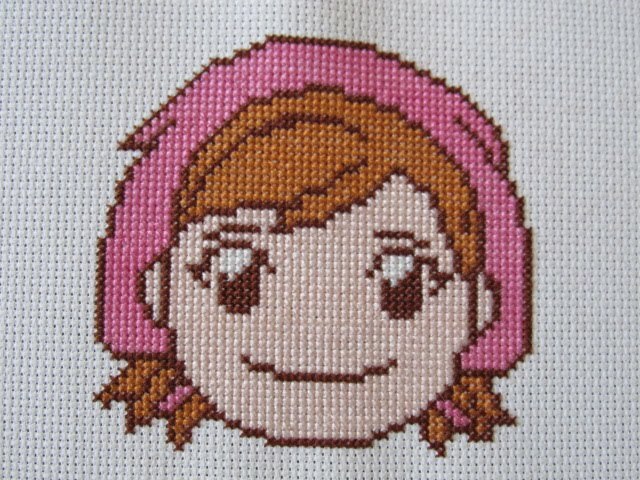 Here is Cooking Mama. It was a pretty easy piece to complete. 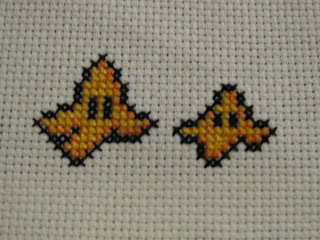 This pattern can be found here. 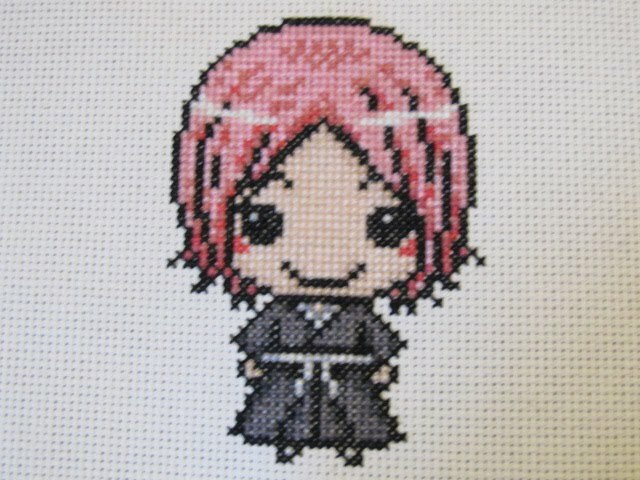 Here is the cute Yachiru from Bleach. 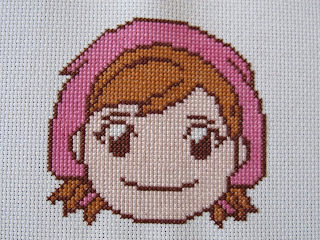 You can find her on Super Stitch site. Well now to tell you about my injury! It was my Birthday just over a week ago and it was really warm outside-- a rare occurrence on my birthday. I was standing on small snowbank next to the house. I decided to just jump down. HUGE MISTAKE!! When I jumped I sank into the soft snow but I kept on moving forward. The split second thought was to protect my stitching hand... I did just that----which I though was really cool. I landed on my right side in the soft melting snow and I felt fine until a couple days later...... It hurt from my neck to my hip. For the most part I have healed except my neck and I have been getting mild headaches to migraines for a week now. Yesterday I was explaining to my chiropractor what happened and he thinks I'm experiencing a mild case of whiplash from my fall. I'm not sure when I will heal from this. I am hoping soon!! At least I'm still stitching a bit at a time but it is better then no stitching at all!! very cute finishes! sorry to hear about your injury, ouch! Your stitches are so cute! Feel better soon and exact revenge on the evil snow! Great stitches once again! Hope you feel better soon. Can't help but admire your insinct to protect the stitching hand! 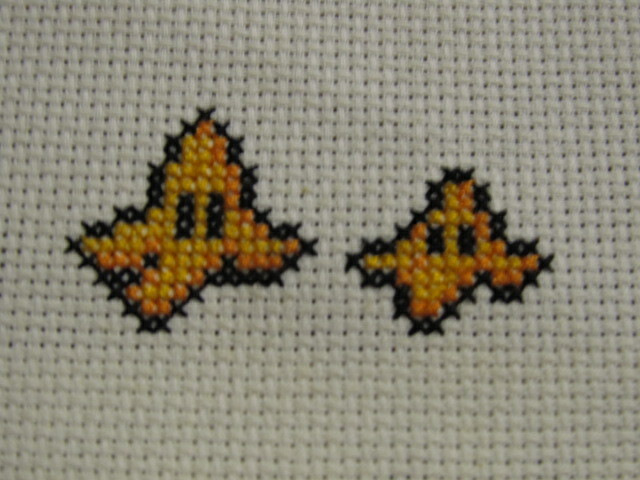 The other sticthy bits are good too -- just goes to show that small pieces can be as rewarding as big pieces!!! Cute finishes. Happy late birthday! Sorry that you hurt yourself. Hope you feel better soon! Very cute finishes :) Happy belated birthday. Hope you get well soon.